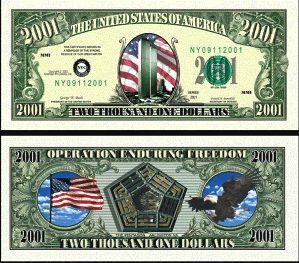 After 9/11 Dollar Bills; collect all 4 of them or re-sell them and start your own business! Buy them separately or in a complete set; the more you purchase the cheaper they are! A perfect gift for any patriot! In remebrance of our fallen heroes! 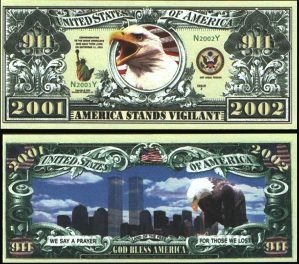 Our After 9/11 bill is one of our largest sellers; transparent twin towers? 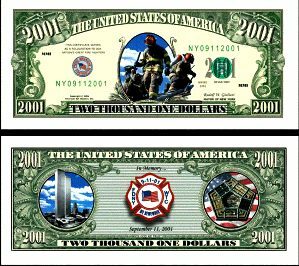 Our Before 9/11 dollar bill shows the World Trade Center! Depicts our firemen heroes of 9/11 at ground zero! 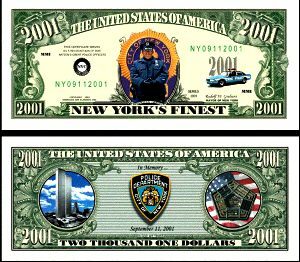 Remember our New York's Finest in action during 9/11?